Squamish Slow Ride on 99. On the Highway for the Slow Ride on 99. “If there's a unifying element in the community these days, it's frustration over the the highway,” said organizer Paul Demers. Significant cycling and pedestrian traffic is forced onto the highway and the “slow ride organizers want to remind drivers of that. They also hope to demonstrate to the District of Squamish and the Ministry of Transportation and Highways of the need for a proper multi-use commuter trail in the valley. 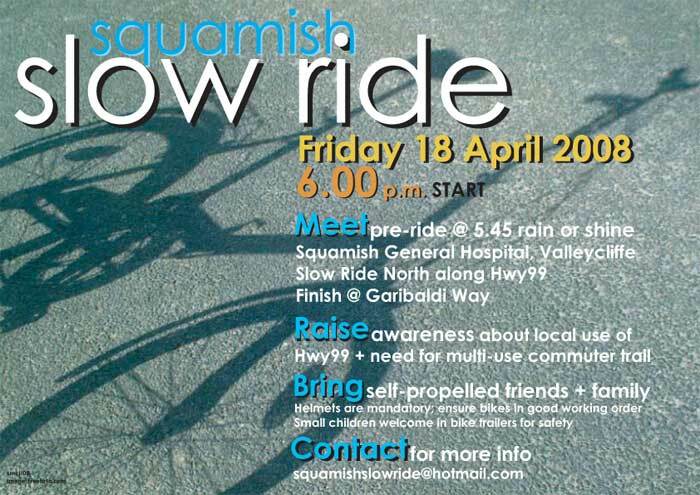 The “Slow Ride” is scheduled to begin at the south end of the valley at 6:00 pm on April 18 and the cycling procession will make its way north to Garibaldi Way at a steady cycling pace. Demers also hopes that local traffic will plan for the ride and keep the highway traffic to a minimum. Anyone interested in participating in the event should meet in the lot by the hospital by 5:45 and be prepared for a 6:00 pm sharp start. All riders must wear helmets and ensure that their bikes are in good working order.